This is a photo less known but I think it needs some extra attention because it’s a beauty and there are a lot of little details or tricks I used. 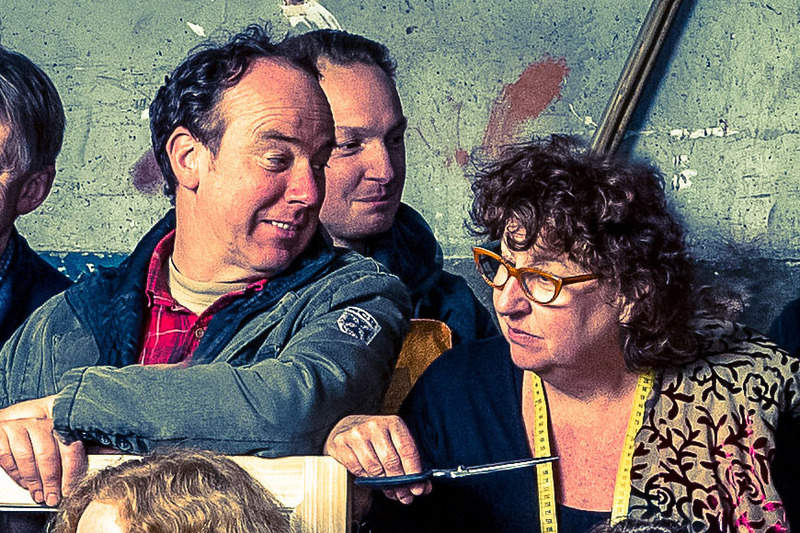 A few years ago I was asked to make a group portrait of the craftsmen of ’Ambachten de Pijp’. I'm a member of Ambachten de Pijp. It’s easy to put people in front of a camera and take a picture but the result is too ordinary and that I didn’t want. I thought about how and what I was going to do and here is in short my thought process. Since we, the craftsmen, live in the beautiful city of Amsterdam I wanted to make a historical photo, one that has strong reference to our Golden Age, a kind of local approach. I went to visit the Rijksmuseum around the corner to have a look at group portraits. Composition wise there were a few options. And also, very important is my own style or what I love in photography: when it comes to people I like the light similar to the old paintings. The light always comes from the left (except in etchings). For me light is extremely important so obscure darker photos where light and darkness play an important role I find very beautiful. Needless to say, I’m a big fan of Rembrandt because of his approach: the importance of light, the expression of character rather than emotion, and the realistic approach, people are who they are not a bunch of beauty queens. If I take portraits of people I prefer to do it this way, similar to Rembrandt and other painters from that time who were great in the use of light. Here are some paintings I liked when visiting the Rijks. These are great paintings but for my purpose not good. The craftsmen of ‘Ambachten de Pijp’ are at least 22 people so that wouldn’t work. Also I thought these paintings were not lively enough (the craftsmen are a lively group of people). The painting of Bartholomeus van der Helst was nice but it’s a kind of flat and people are posing so that makes it less interesting (in Rembrandts time people started to love van der Helst more than Rembrandt because people looked more rich, clean, nice and also most people have the same size or attention on the painting, very democratic which I don't like). The good thing of van der Helsts painting is he uses a lot of people and they have different fashionable outfits. But the use of light is rather boring and it lacks story or dynamics in my opinion. The Night Watch. Initially I was very reluctant to use the Night Watch as my point of inspiration (everybody does, feels a kind of fashionable). Here I show you a copy by Gerrit Ludens of the Night Watch (in the Rijks it is on the right side of the real Night Watch) because I much more like the composition of this painting. The Night Watch of Rembrandt they cut of parts of the canvas to make it fit in a smaller space. I really don’t like the composition of what is left of the Night Watch of Rembrandt, every time I see it, it bothers me a lot so that's why I show this version here. I think the Rijksmuseum should put some lines one the wall to express the original canvas so people will better understand this painting. As said before reluctantly I arrived at the Night Watch which is very dynamic. What makes the dynamics? The people express little different stories, in the same painting are happening different things. Also interesting is that the painting has a clear central point which I also found important for the photo I was going to take (actually any photo I take). And of course there is the rather dramatic use of light. You may notice all the paintings I'm showing here I 'restored' to what they could have looked like in the days when they were painted. Some colours fade more than others and the blacks are becoming more prominent. Why the restored version? Well, it's just a little experiment of mine to see what I get and it's interesting. And in the case of the Night Watch here above, yes, I'm much more happy to see the original composition. 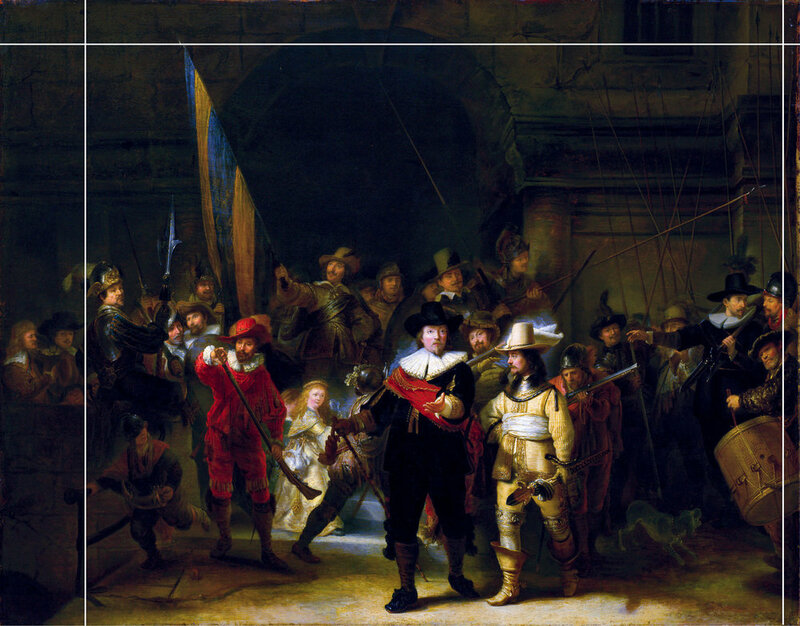 After my visit of the museum the Night Watch became the inspiration of my group portrait to be. Problem or challenge for me was now: the craftsmen in my photo shouldn’t have the same kind of clothing. Unlike in the painting of Rembrandt in my photo I want to express via clothing and objects what their craftsmanship is about so they will look diverse. If they look too diverse the photo will be messy, you need style. In order to get some style I asked the them to wear dark clothing and hopefully that would work out well. And also I wanted them to dress well because similar to the Golden Age, people tried to look good on the painting and that too I wanted in my photo. I traded in personality for emotion, but kept the use of dramatic light, people are realistic and natural (not fashion dolls) and the photo has a central point of attention. The central point of attention I achieved through central composition, light and local strong contrast in the center. Here you see the center of my painting/photo. You see Sasha sitting between two women. But also, she becomes more important because she’s the only person who looks at you out of the photo (or doesn't she?). And interesting, if you pay attention to the Night Watch you will find that this almost invisible man hidden behind the others is actually the only person who is looking at you out of the painting. Nobody else is. Visit the Rijks and you will see. What’s also similar to the Night Watch is that there are many different stories, many different things happening. Here I’ll show you a few ‘close ups’ which will be lost if I just post the whole image. And finally here is the whole photo. I'm glad you took time to have a look at my 'making of' this group portrait made in old Amsterdam by a modern craftsman in style with the city's heritage. At last I want to thank my assistent at that time Arjan again for helping me with this rather difficult photo.